GC107-is Bags and Tags. I had a bunch of these kraft gift bags in my stash waiting for something so when this challenge came up I thought...bingo, I can use this for the challenge. I have some beautiful K and Company paper packs and I found this vintage looking wallpaper paper to apply to the bag. I first distressed the edges with my scissors then I used Jumbo Java ink to age the paper. I cut out both flourish die cuts from Tim's Sizzix die then painted it with copper, burnt umber and a bit of turquoise acrylic paint in a slip slap manner. 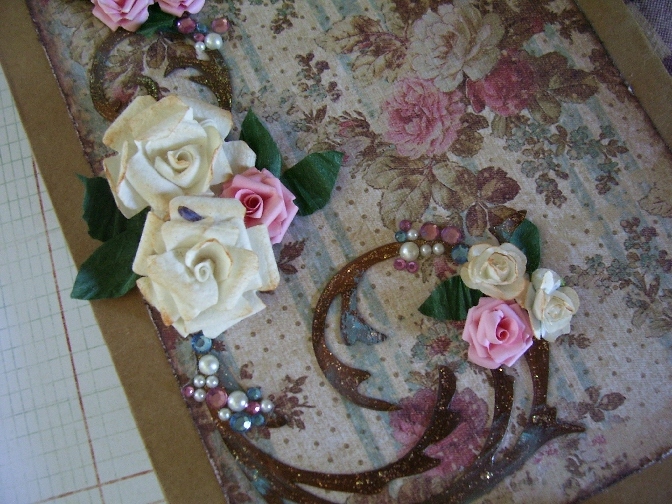 After that was dry I applied Diamond Stickles to the flourishes and set them aside to dry. I then made these white roses out of handmade paper using Tim's Tattered Florals die cut and they turned out better than I expected, wish I had more of that paper, it had flecks of little bits of lavender and leaves in it in case you are wondering what some of those things are on my roses. I then lightly tinted them with some Tea Stain DI, just to tone down the white and to age them a bit. I also found some pink roses already made in my stash and added them and I used some of that twisted paper to make leaves. I added some bling with the colours that were in the paper and just placed them here and there. 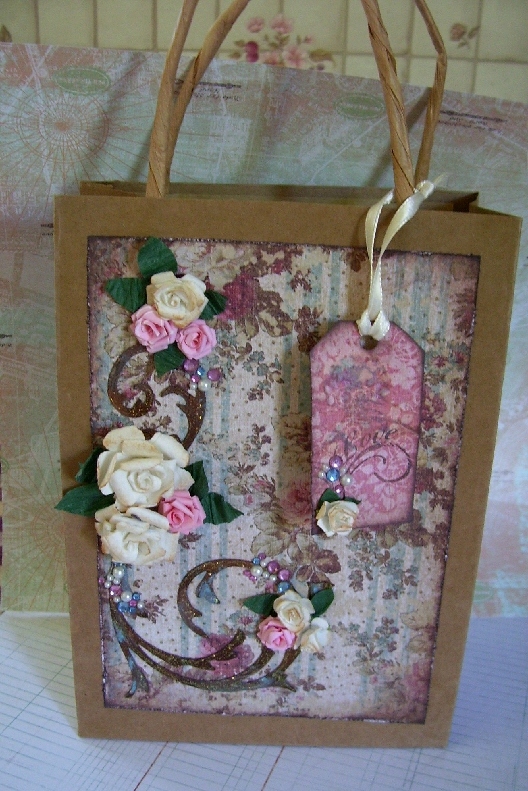 I also made a tag using the opposite side of the paper on the bag, stamped a Love Flourish stamp in Jumbo Java from Stampology. Then just placed a little white tinted rose along the bottom and attached it to the bag. Now I have a lovely bag to put a gifty in for the future. This was fun and I think I will have to make a few more. And now that the mail strike here in Canada is over it is fun to get the mail again. Today I received a much anticipated trade I did with 2 online friends. 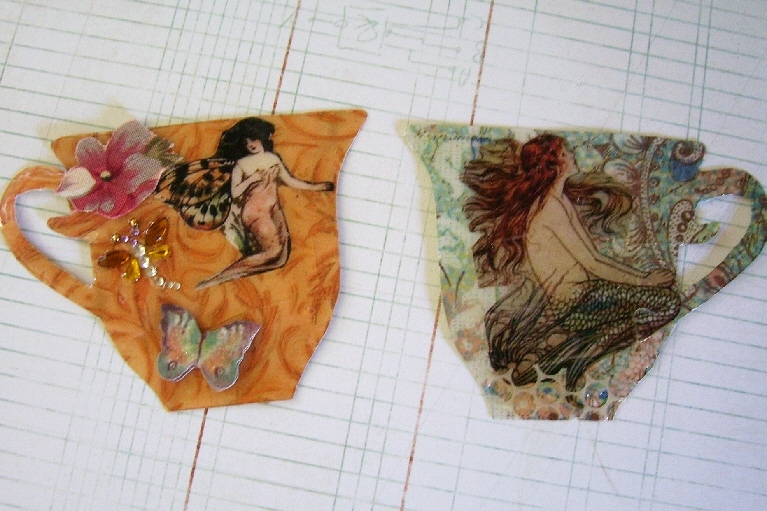 Wendy over at BlissAngels asked Jeanie and I if we wanted to do a trade in the theme of teacups. So I made 3 cards of 2 different designs for the 3 of us .Today I got Jeanie's cards and here they are, they look like china, she has applied Glossy Accents over top of the images and they just shine. I had a bit of a time separating them because of the humidity but no damage was done. Just a bit tricky and delicate surgery but all is good. Thanks so much Jeanie and thank you all for visiting. Sorry Jeanie and Wendy I didn't add your links but please take a look along the sidebar to visit both their blogs. Glad they got there and that you like them. I'll remember about your problem the next time I send things covered with Glossy Essentials. Your bag is just really gorgeous! Les.. that bag turned out so pretty...love the flourish die cut.. definitely a make more item.. and the teacups are gorgeous..
Wow Lesley, how do you get such wonderful texture? its gorgeous. love all three of these pieces they are stunning. thanks for your lovely comment on my blog too. The images are great for digital but also great just to print and use in collage. which reminds me, i must get some more ink for my printer lol. Love your bag Lesley and thanks for the description of how you did it! I just realize I should have mentioned you in my blogpost on the teepee card cos I knew I had seen it somewhere, but I forgot where lol, sorry about that. I'll def. make more of those too! What a beautiful bag! It's so elegant. Thanks for playing with us at Gingersnap Creations! !